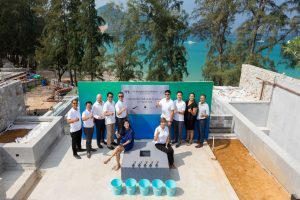 The developers of MontAzure, the upscale residential resort community on the west coast of Phuket gathered in Kamala with the joint venture partners to celebrate the completion of the main structure at its unique beachfront condominium development, Twinpalms Residences MontAzure. Designed to take full advantage of its unrivalled oceanfront location, the development comprises a series of low-rise clusters set amid tropical landscaped grounds with two communal swimming pools and a range of onsite resort facilities. One-bedroom units start at 70 sqm, two-bedroom units range from 154sqm to 400sqm, and a select number of super penthouses offer breathtaking views of Phuket’s idyllic sunset coast. “As our first residential phase, Twinpalms Residences MontAzure offers a unique integrated beachfront resort concept within easy reach of Phuket’s most appealing lifestyle attractions. 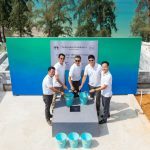 Café Del Mar officially launches this week, which is also part of MontAzure, so the timing couldn’t be better to complete the main structure of the condominiums,” said Richard Yue, CEO of Arch Capital Management, one of the three joint venture partners behind the MontAzure mixed use development. “Other word class components within the MontAzure community include the new InterContinental Phuket Resort, which opens in 2019 and Kamala Senior Living, an exclusive residential village being developed in the nearby hills,” he added. Twinpalms Residences MontAzure will be managed and operated by Twinpalms Group to offer owners a combination of hotel-driven yields, capital appreciation and personal usage time. Entry-level units start from Entry-level units start from 15.5 Million baht (USD 489,000) and more than 70% of the project has already sold out with prices expected to rise significantly on completion. To mark the milestone achievement, MontAzure is offering buyers a guaranteed return on investment for 3 years on selected units, as well as free furniture packages worth up to THB 2 Million (USD 64,000).